Sources said the mood in TDP is to sever ties with BJP and go it alone in the 2019 Lok Sabha and assembly polls. Pushed into a corner, some state leaders of BJP say they are not too worried over TDP’s threat. N Chandrababu Naidu during a meeting with cabinet ministers at secretariat in Velagapudi of Guntur district. 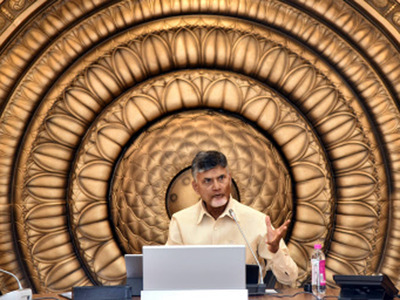 VIJAYAWADA/ GUNTUR: A day after expressing his unhappiness over the “shoddy treatment” meted out to Andhra Pradesh in the Union budget, CM Chandrababu Naidu remained closeted in meetings on Friday. Sources said the mood in TDP is to sever ties with BJP and go it alone in the 2019 Lok Sabha and assembly polls. “At a video conference held by the CM, majority of the leaders wanted the party to pull out of the alliance,” sources said. Pushed into a corner, some state leaders of BJP say they are not too worried over TDP’s threat. “We want the alliance to be intact. If TDP has second thoughts on this, let it be. We are not bothered,” Jammula Syam Kishore, state general secretary of BJP,told TOI. Another leader said on condition of anonymity that a section of state BJP was wary of an alliance with TDP from the beginning. “We had alerted our party’s central leadership long ago about the cunning politics of TDP, but sadly, they didn’t take enough measures to rein in our coalition partner,” rued asenior BJP leader.